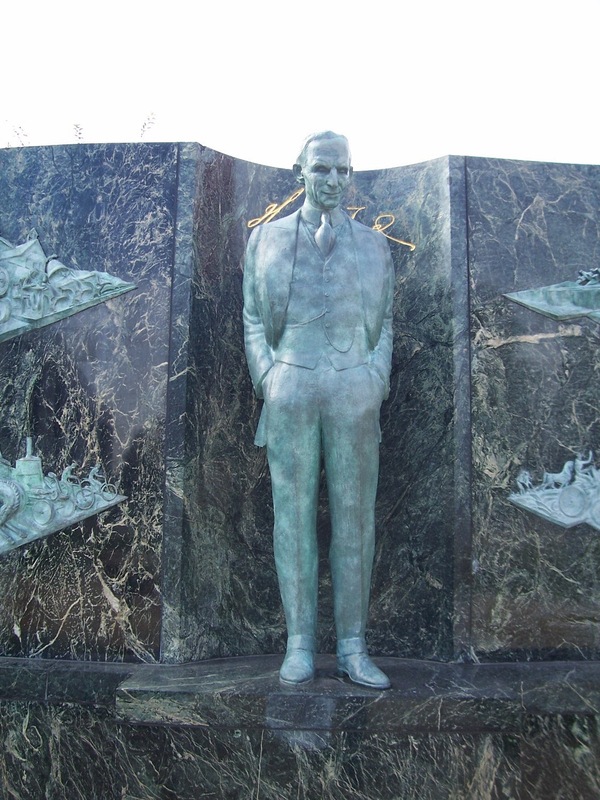 Henry Ford statue in Dearborn. If there's any figure who looms over Detroit, it's Henry Ford, the original. And he was just that. The mention of the name of the man who developed the Model T and founded the Ford Motor Company in 1903 still can spark discussions among Detroiters. Some see him as a dictatorial monster who wanted to control the lives of his workers, while others point to the $5 a day offered to auto workers in the late 1910s as the true start of a middle class in America. The statue of him, left, is located at Dearborn's Henry Ford Centennial Library on Michigan Avenue across from the Ford World Headquarters. I discovered it when researching my travel guide, Detroit & Ann Arbor: A Great Destination. The book is organized into driving cruises along major arteries. My favorite is the Michigan Avenue route because it takes a driver from downtown to Ypsilanti, and along it are the bones of what Detroit once was. The Corktown area, which was once a prime neighborhood for working class Detroiters, straddles the corridor. There's also Mexican Town, and the now decimated but once vibrant Del Ray, which was home to a Hungarian enclave. Further up Michigan is the Ford Rouge Plant, which was once the largest in the world. The tour ends in Ypsilanti where Ford built a bomber plant that supplied planes to the allied air forces during World War II. The book tells readers where to eat and what to see, and also delves into the history of the area.